In “Sports Psychology Sessions with Doc,” Dr. Patrick Cohn answers a question from a sports parent who doesn’t know what to do with her 10 year old tennis player when he gets upset on the tennis court. Do you have a young tennis player that tends to either give up, tank or get really upset emotionally because they’re playing a tough opponent or losing? This is the #1 complaint that we get from sports parents about how kids tend to act out, check out, tank, get emotionally upset and frustrated and then their performance snowballs out of control because they can’t regain emotional control. One of the worst things you can do as a parent is bring attention to their frustration and punish them for it. They only learn that the behavior is wrong but not the skills to improve that behavior. 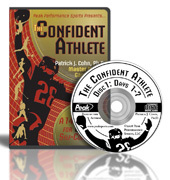 What can you do as a sports parent to give them the skills to stay composed? Watch the video to see what mental game tips Dr. Cohn gives to sports parents to help their young athletes deal with their frustration.